In case you haven’t heard, sitting is the new smoking. Medical research has been sounding the alarm for the last few years about the hazards of too much time spent sitting. Those endless hours spent planted in a chair may seem harmless, but have been linked to an increased risk of heart disease, diabetes, cancer, and depression. Unfortunately, there’s more bad news: The average person is spending about 12 hours daily being sedentary, and according to the Center for Disease Control and Prevention (CDC) we should engage in 150 minutes of moderate-intensity physical activity weekly. But don’t throw in the towel or feel defeated if you are among the nearly 80 percent of adults who do not meet those guidelines. “Any activity, no matter how intense, provides health benefits,” says Keith Diaz, Assistant Professor of Behavioral Medicine at Columbia University Medical Center. Some good news! Even though most types of yoga are considered light intensity, doing your sun salutations can help to offset the negative effects of sitting hunched over all day. The goal is all about moving on a regular basis. “I would recommend yoga to anyone and if you enjoy it, odds are you will be more likely to keep doing it for years to come,” Diaz says. To offset the consequences of sitting, there are certain postures you should try. 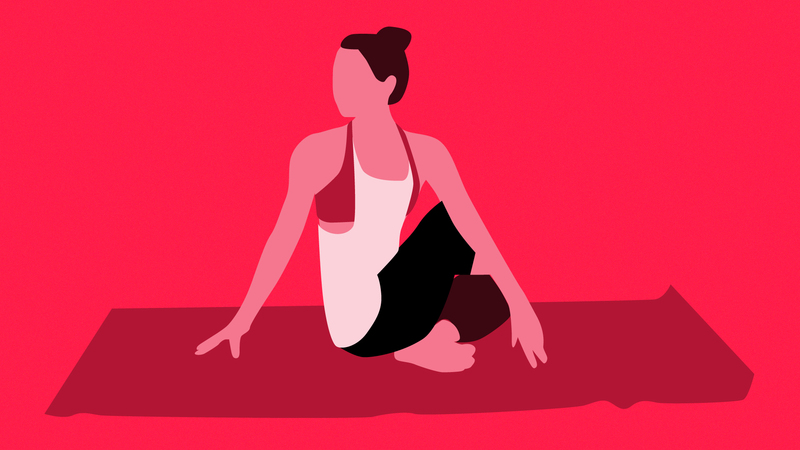 “If you spend a lot of time being sedentary, then the ideal yoga program should focus on poses that are in the standing position,” says Patricia Frieberg, yoga and Pilates instructor and group fitness manager at Equinox Westlake Village, CA. Stand with your feet together or hip width apart. Ground into the four corners of the feet. Lift up through the thighs, hip bones gently pulling up toward the ribs, the chest is open, ribs soften downward. As you press into your feet, feel the length through the crown of your head. Hold for 15 seconds and repeat three times. Place blocks shoulder distance apart at the front edge of the mat, either flat or in the high position. Place hands on the blocks. Boost your right foot between your hands, while the left leg is in a long lunge with the knee on the floor. The hip bones should be facing forward. Sink into the stretch and lower your tailbone. Right knee aligns over right ankle, and the top of your left foot can release to the ground. Hold for three to five breaths, then repeat on the other side. From crescent pose get into the plank position. Step your right foot forward in between the hands and spin your heel down at a 45-degree angle. Align the right heel with the left heel, exhale and turn your torso to the right, keeping your pelvis squared toward the front edge of your mat. Lift up through the knee cap of the back leg. Extend the arms overhead shoulder distance with palms facing inward, while keeping the shoulders drawing down away from the ears. Lengthen your coccyx toward the floor, and arch your upper torso back slightly. Hold for 20 seconds and repeat on the other side. From Warrior I, step your right forward and left foot back. Turn your left toes out to the left as you press down through the left foot. Bend deeply into the right knee with thigh parallel to the ground and stack your knee over your right ankle, keeping the toes pointed in the same direction. Open up the arms so that they are outstretched away from the midline and parallel to the floor. Take your eye gaze over the center of the front hand. Hold for 20 seconds and repeat on the other side. Stand with your feet about three and a half feet apart. Raise arms parallel to the floor and extend them out to the side, palms down. Rotate your left foot to the right and turn your right foot to 90 degrees. Align your right heel with the left. Inhale then exhale, and extend your torso toward the right toes. Bend from the hip and lengthen your tailbone. Place your right hand on your ankle or shin. Send your left arm upward toward the sky as you ground through the bottom arm in opposition. Maintain the pose for four to six breaths. Repeat on the other side.